I used to rack my brains wondering what gifts to buy for kids for their birthdays or for the holidays. Then I met Marcus and he gave me a simple solution. There are only two things that he buy as gifts for kids: books and art supplies. Books and art supplies are gifts that kids can enjoy for many months or years to come, whereas the latest trendy toy may only get their attention for a days or a few weeks, or even worse, just a few hours. Books and art supplies help kids tap into their creativity and will also unleash their imaginations. I believe that is one of the greatest gifts you can give a child. I will warn you now that some kids may not have much of a reaction when they first open your gift–this is especially true if they’re used to getting every gadget or gizmo they ask for–but later, in a quiet moment in their room, that kid will read the books or start tooling around with the art supplies and they will likely really enjoy it. This gift-buying rule also really simplifies holiday shopping. When you know what you’re buying, shopping becomes easy and way more pleasurable. And don’t we all need a little more ease and pleasure during the holidays? For ideas on which books to buy, check out your local library’s recommended reading list. 1) Buy art supplies in August/September during Back-to-School sales. 2) Buy used books from Half-Price Books, your local used bookstore (my favorite is Magus Books in Seattle’s University District), or the Goodwill where you can find excellent buys on children’s books. 3) Buy new or used books from your local independent bookstore. Let’s keep the indies in business! 4) When I see something that I know one of the kids in my life will like and it’s on sale, I buy it and store it in my closet. Sometimes, I will wrap the gift and put a post-it on it so I know who it’s for. NOTE: We also sometimes buy board games. Like books and art supplies, great board games can provide years of fun for kids and their families and friends. Be Super Frug and keep your eye out for sales. Stores like Fred Meyer often put their board games on sale (ie. Buy One, Get One Free) several times a year. Do yourself a favor and try this simple shopping technique next time a kid’s birthday comes up or the holidays roll around. Shop just for great books, art supplies and/or board games. You’ll thank yourself later–and I’ll bet the kids who receive your gifts will too. ps. 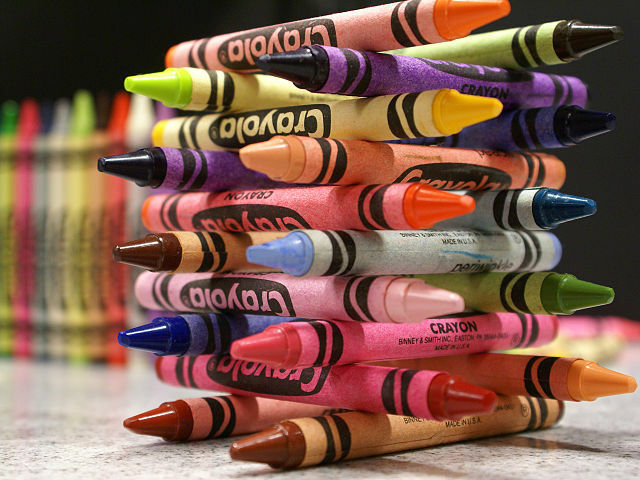 Crayon tower photo by Chris Metcalf.